Talk about shooting yourself in the foot! 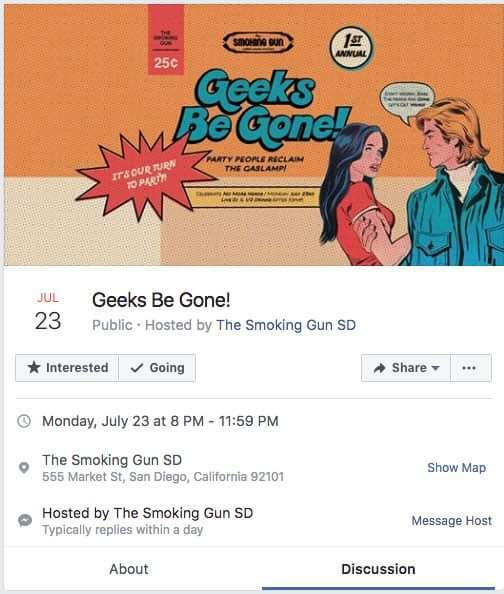 The Verant Group's public relations firm may be in hot water after promoting a post Comic-Con Industry Night at San Diego's The Smoking Gun entitled "Geeks Be Gone! ", which has many upset and caused the downtown bar & restaurant to be assaulted with negative online reviews. "I’m the GM there," said Reddit user Juanpablo_the_cat on a thread about the event. "It was a huge verbiage mistake on our behalf. Being a San Diegian veteran, I love comic Con and all the attendees. We were simply throwing a post Comic-Con party for all those who work downtown tirelessly by offering a half off the bar night for them. I apologize to anyone who is offended, our whole bar concept is a nostalgic them with peechy folders even being used as our cocktail menu. Our apologies San Diego, we never meant to cause harm or offend anyone." 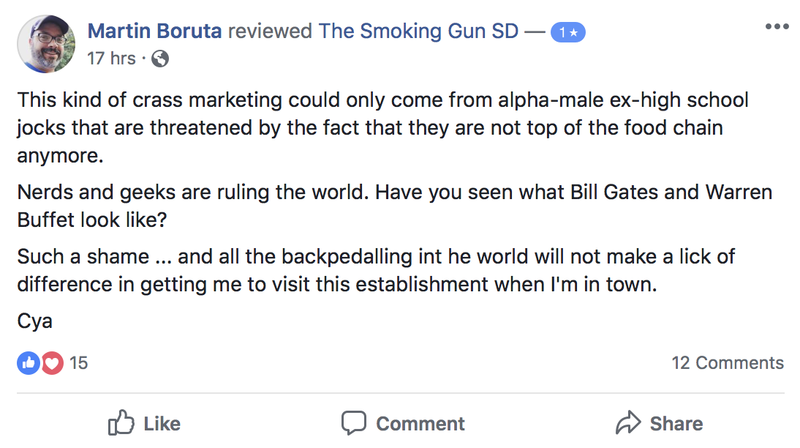 Later, the person claiming to be The Smoking Gun's General Manager also added that it "was [an oversight] I missed that our PR [public relations] did. It falls on me." The Smoking Gun is owned and operated by the Verant Group, which also owns many other San Diego spots including Tavern, Sandbar Sports Grill, True North Tavern, Barleymash, Westroot Tavern, and Maverick's Beach Club. Mark Cirillo, Joe Vaught and Eric Lingenfelder are the founders and principals of the company. Verant Group's longtime public relations firm is Alternative Strategies, which is owned and operated by William Lopez, who tried his hand in the restaurant industry for a brief period with the short lived Como Ceviche in the East Village. We reached out to all above-named parties for comment and clarification but did not receive a response to our email. The since-deleted Facebook event, entitled "Geeks Be Gone! ", was to be held at The Smoking Gun on Monday, July 23 - the day after Comic-Con ends. 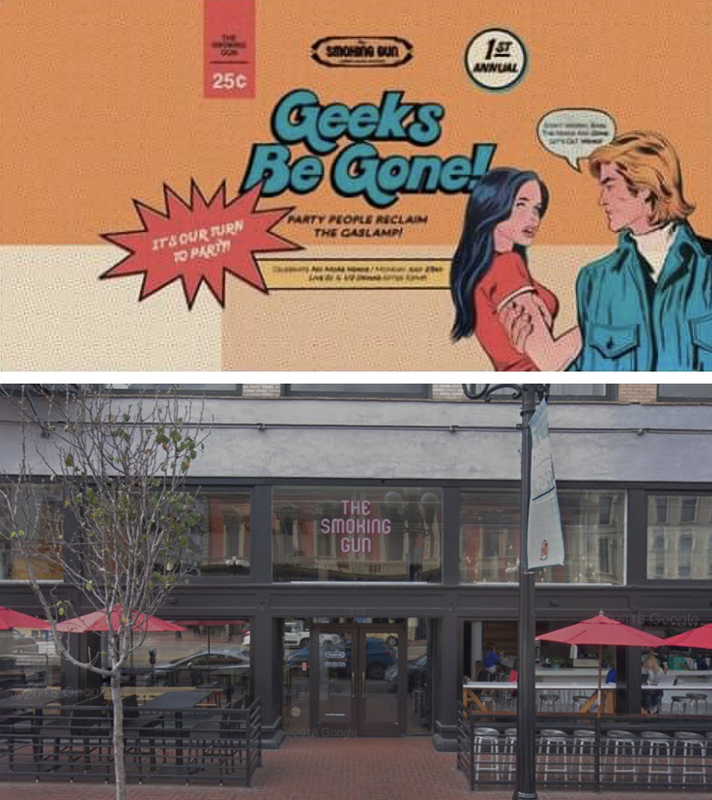 The event description for the "1st Annual Geeks Be Gone!" 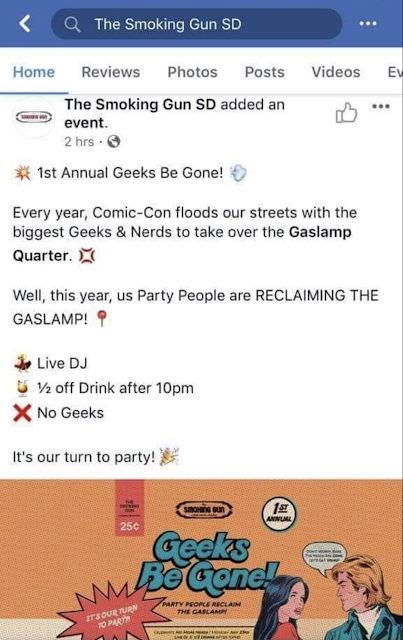 (it should be 'Inaugural') promised a "Party People" to "Reclaim the Gaslamp" after "the biggest Geeks & Nerds" took over downtown San Diego during the previous week. 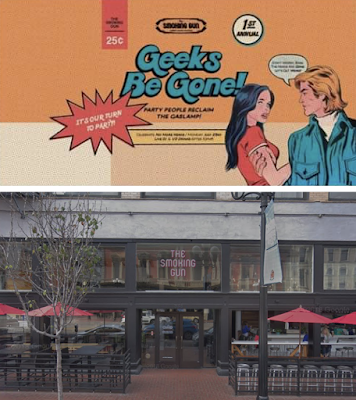 It promised half-priced drinks, a live DJ, and no geeks allowed. The general consensus echoed in online reviews is that the event was insensitive, promoted a bully-mindset, and failed to adequately appreciate a population that brings an influx of income into our city. The Smoking Gun's Facebook Page currently has a cumulative 2.2 star rating after upset followers lashed out with negative comments. Some San Diego Comic-Con attendees have even planned to boycott the bar and other Verant Group establishments during the event. The Smoking Gun is located at 555 Market Street in San Diego's Gaslamp. For more information, visit thesmokinggunsd.com.